, an ingenious mathematician, lord of Killingswald and of Stolzenberg in Lusatia, was born April 10, 1651.After having served as a volunteer in the army of Holland in 1672, be travelled into most parts of Europe, as England, Germany, Italy, France, &c. He went to Paris for the third time in 1682; where he communicated to the Academy of Sciences, the discovery of the curves called from him Tschirnhausen’s Caustics; and the academy in consequence elected the inventor one of its foreign members. 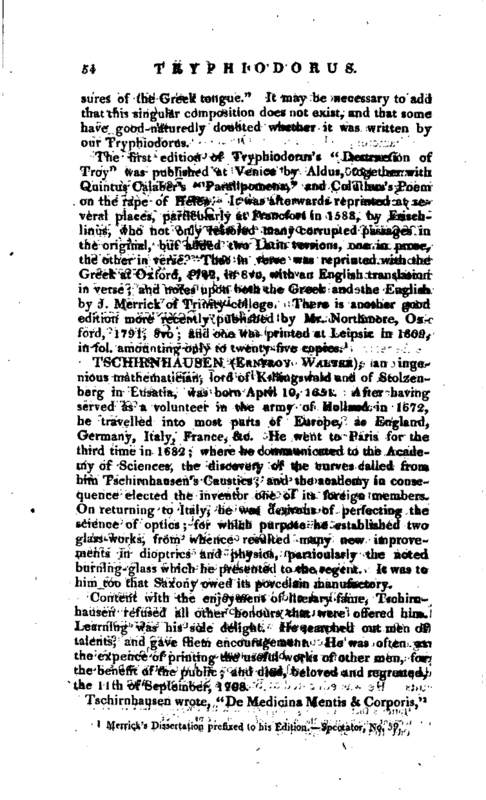 On returning to Italy, he was desirous of perfecting the science of optics; for which purpose he established two glass-works, from whence resulted many new improvements in dioptrics and physics, particularly the noted burning-glass which he presented to the regent. It was to him too that Saxony owed its porcelain manufactory. 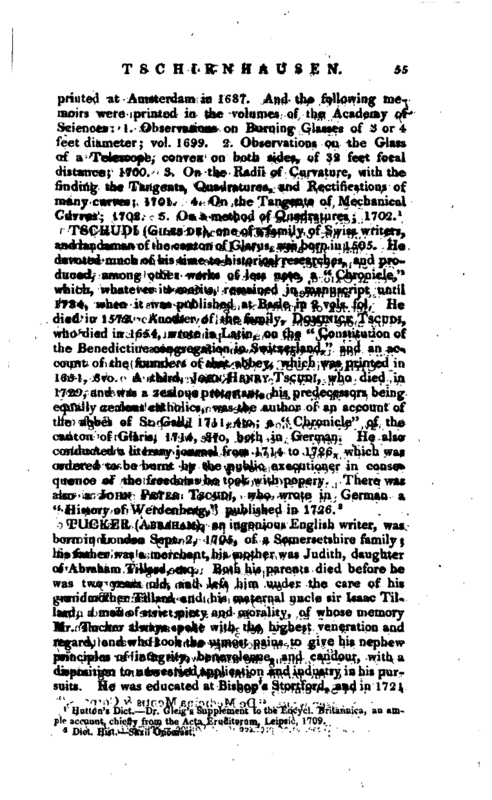 Content with the enjovment of literary fame, Tschirnhausen refused all other honours that were offered him. Learning was his sole delight. He searched out men of talents, and gave them encouragement. He was often at the expence of printing the useful works of other men, for the benefit of the public; and died, beloved and regretted, the llth of September, 1708. Hutton’s Dict.^ Dr. Gleig’s Supplement to the Encycl. Britaimica, an ample account, chiefly from the Acta Eruditorunt, Leipsic, 1709.